This video provides you with a walk-through of artist Josiah McElheny’s solo exhibition The Crystal Land at the gallery White Cube in London. The show features works in various media including sculpture, painting, film, installation, photograms and posters. Created between 2008 and 2017, the works represent the artists efforts to visualize alternative histories of Modernism. The Crystal Land is divided into three sections: a series of wall reliefs (Crystal Landscape Paintings) inspired by the artist Robert Smithson; a film, including a “glass cinema” and movie posters (The Light Club of Vizcaya: A Women’s Picture) inspired by the writer Paul Scheerbart; and a large-sacle installation (Island Universe) inspired by the physicist Andrei Linde. Josiah McElheny was born in 1966 in Boston, Massachusetts. The artist lives and works in New York, NY. The exhibition The Crystal Land runs until April 13, 2017. Josiah McElheny: The Crystal Land. Solo exhibition at White Cube, South Galleries, Bermondsey, London (UK). Exhibition walk-through, February 28, 2017. The exhibition is divided into three distinct sections, each of which is inspired by an individual: the artist Robert Smithson, the writer Paul Scheerbart and the physicist Andrei Linde. In the first part of the exhibition, McElheny draws on some of Robert Smithson’s lesser-known works and writing from 1964─66, including his essay The Crystal Land which was published in Harpers Bazaar in 1966 and from which the exhibition borrows its title. Smithson’s series of ‘paintings’ from that same period ─ reflective plexiglass and painted metal, fashioned into three-dimensional, crystalline constructions ─ complicated the prevailing Modernist rejection of painting as a window onto the world and assertion of painting as pure surface. 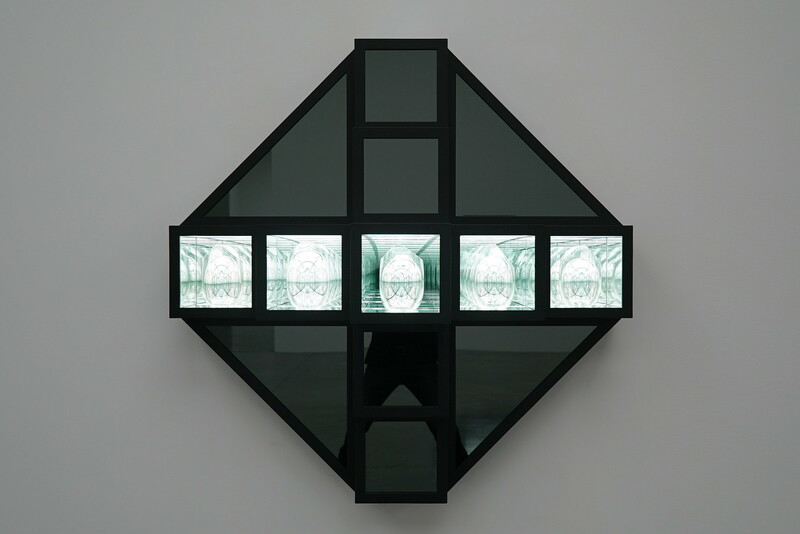 Using these works as models, McElheny has created his own series of ‘Crystal Landscape Paintings’, taking the form of faceted wall reliefs constructed out of painted metal and glass mirror with illuminated interior chambers. Inside these chambers, infinitely repeating images of crystalline, abstract reflective shapes recede into the distance. Interspersed among these ‘paintings’ are a series of new ‘Anti-Vortex Drawings’ in which lines appear to float inside glass against a fractured mirrored background, and a group of silver gelatin photograms, studies for new crystalline forms in which geometric shapes extend into black. In these works, McElheny proposes that an imaginary world could be something physical after all. After the intimate vistas of McElheny’s ‘paintings’, he offers a different kind of contemplation in the second part of the exhibition, through the combination of image and language. Here, movie posters beckon the audience into a ‘glass cinema’, whose subtle, multi-coloured light emanating from glass-block windows, sets the tone for the film playing inside. The Light Club of Vizcaya: A Women’s Picture (2012) emerged out of McElheny’s interest in the work of Paul Scheerbart and is part of his effort to bring the German author’s writing into the 21st-century – a project that includes the publication of two scholarly books on Scheerbart as well as a series of sculptures, drawings and performances based on his ideas. In this film, McElheny develops Scheerbart’s short story The Light Club of Batavia: A Ladies’ Novelette (1912), a fantastical tale about a group of socialites who meet at a hotel in Batavia (now known as Jakarta) and decide to build a spa at the bottom of an abandoned mineshaft so that they can ‘bathe’ in light. With a script written by Canadian poet Rachel Zolf and a voice-over narrated by the artist Zoe Leonard, McElheny presents a poetic, ‘speculative expansion’ of Scheerbart’s original text, re-staging it in a different locale to create a story-within-a-story that playfully deals with themes of gender, sexuality, society and nature. Presenting an alternative view of Modernism, as experienced by a female protagonist, the work deals with Scheerbart’s notion of universalist politics as a wholly other possible path of history. It proposes that Modernism might have been redirected from efficiency and restraint to expand the concept of the human.